It doesn’t take long to pick them out: men and women of all ages, most carrying backpacks and using tall walking sticks, dressed in anything from ragged shirts and trousers to high-end hiking gear, and wearing – in general – decent hiking books, these people can be seen along roads, on paths in the rolling hills, and in town squares up and down the entire length of Italy. They are pilgrims, and it is likely they are traveling the Via Francigena, also called the Via Romea (depending on the direction one is traveling – if north, it is the Via Francigena), stopping at holy cites along the way in a ritual that has been repeated by generations of pilgrims, merchants, sightseers, and soldiers since the latter part of the 9th Century. The Via Francingena runs for approximately 1800 km; from the south porch of Canterbury Cathedral in England it crosses to France, runs through Switzerland, and culminates in Rome, at St. Peter’s Cathedral. In the past, pilgrims stayed at abbeys situated along the route and relied on the kindness of holy people and other travelers or those citizens of countries they met along the way. 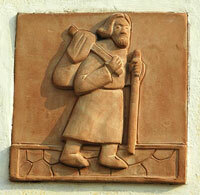 Making a pilgrimage was considered a holy endeavor, and was not taken lightly. The average time to walk the route was three months – one direction – and this time away from home was not infrequently a hardship on both the traveler and those who stayed behind. And while pilgrims tended to travel in groups, their inner journeys tended to be quite personal. No one is entirely certain how long the Via Francigena has existed. The first mention of it that has been found to date is in a parchment in the Abbey of San Salvatore al Monte Amiata, dated 876 C.E. The first person to document the entire length was Sigeric the Serious, the Archbishop of Canterbury in (circa) 990 who set out from Canterbury to Rome in order to receive a pallium – an ecclesiastical vestment – from the pope. He laid the route out in 80 stages, and walked the entire way in as many days, describing the stops along the way. While not a map of the route, this manuscript lays out the nightly stops; as such, it does not record the actual path or track between those stops. In essence, this manuscript – rediscovered in 1980 and housed now at the British Library – echoes the ephemeral nature of not only the route itself but the many reasons a person might have for following it. The Via Francigena is most popular from May to October, where it is also the most expensive. While some abbeys still exist that will house pilgrims, often today’s pilgrims either camp or stay in hotels or B&B’s. The route runs along roadways, through fields, over mountains and through forests. Many people walk partial distances; from one town to another is a common way to traverse the route. Cities along the way, in Italy, include: Aosta, Ivrea, Vercelli, Pavia, Piacenza, Pontremoli, Luni, Massa, San Gimignano, Siena, Viterbo, Rome. Unlike Roman roads which historically went relatively straightforwardly from point to point, and were paved and therefore did not change over the years, the Via Francigena has not remained unchanged in the 1000-plus years of its existence. The actual route has varied depending on trading and merchant centers, which particular saints or shrines were popular during particular periods of time, time of year, and the political situation in the areas through which it passed. Unified nations as we think of them today did not exist until approximately 1600 C.E., so each section of road was often maintained by different nobles, rulers, dukes and the like, leading to quite disparate levels of road quality. The journey was arduous and long, crossing the Alps and the Apennines at altitudes of up to 8,000 feet, was often snowy and cold – enough to freeze to death, as happened to one Aelfsige in 959 – though in some areas was paved in stone or hard-packed by thousands of footsteps throughout history, even as early as 1000 C.E. What unites those thousands of ancient travelers and today’s pilgrims is not only the belief that somehow undertaking such a journey would benefit them spiritually, nor the desire to experience the transformations they hoped to undergo on the way. While these expectations existed then and continue to do so today, the connection runs deeper than that. Travelers today embark on their quests – spiritual or more grounded in the physical challenge – with the awareness that they are setting out on a journey that has been performed by uncounted numbers of people before them, over more than a thousand years. History itself walks with them as they trace the path of a thousand others, and yet, because the road has shifted through time, their journey in fact is new each time. What connects them to the past is an idea. Pilgrims on the way to Rome from a relief on the Duomo of Fidenza, 12th Century. This non-permanence of the actual route of the Via Francigena somehow complements the permanence of an idea – a faith, perhaps – that is strong enough to continue to draw pilgrims from around the world. And whether present-day pilgrims are on journeys to spiritual sites along the way, or to some more grounded goal, they continue to dedicate themselves to the faith that walking along this ancient, always-shifting path will, when they walk onto the cobblestones of St. Peter’s Square in Rome, have given them an experience they can share with not only their corporeal fellow-travelers, but with all the travelers of history. Through InkWell International LLC, Teresa edits and ghost writes for a world-wide client base, and many of her clients have been published in a variety of venues. Through TLC (Travel / Literature / Culture) Writing Tours, Teresa and her partner Paolo Nascimbeni lead writing workshops in Italy (and other countries). These workshops are attended by writers from around the world, and are desirable venues for workshop leaders of all kinds. Her latest book, A Dream That Keeps Returning: Travels in the Italian Sun, a series of travel essays about Italy, is available at Amazon.com, or from the author. For more information about Teresa Cutler-Broyles, InkWell International LLC and TLC Writing Tours, and links to other articles, see www.inkwell-inc.biz.